Gr 3–8—From the recently-discovered notes of a tale that Mark Twain told to his daughters comes the tale of Johnny, a young boy who has been badly treated, but whose positive and charitable outlook on life is generously rewarded. Johnny was raised by a miserable grandfather, and his only friend was a scraggly chicken named "Pestilence and Famine." When he is told to sell the chicken for something worth eating, Johnny and the hen trek to town, where he is again treated badly. His generosity to an old woman earns Johnny magic beans, whose blooms will supposedly stave off his hunger forever. Eating the blossoms brings very unexpected results, however, and sets Johnny up to be the hero who rescues the missing Prince Oleomargarine. 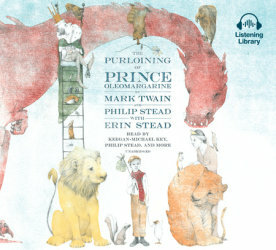 The story is a blend of fairy tale and conversation between the author and Twain, which explains how the latter supposedly revealed most of the tale over tea. The interruptions to the story might be quite distracting to listeners, although the voices are quite distinct. Keegan-Michael Key does an admirable job of relating Johnny's tale with humor and great expression, voicing animals and humans quite skillfully, while Mark Bramhall counters as the voice of Twain, and Julia Whelan as his daughter Suzy. Musical interludes are pleasant but cannot substitute for the elaborate and intriguing illustrations by Erin Stead in the book. VERDICT A charming tale with a wonderful moral, true to Twain's voice, that may inspire listeners to seek out the printed volume and other tales by Twain.